All fields marked with an asterisk (*) are required. The form will not submit if any required fields are left blank. It can be helpful to review and/or print the cultivar registration checklist before typing the bloom information into the form to be sure that you have all the details at your fingertips. It is mandatory that you include at least FOUR (4) color, high resolution digital electronic photographs (approximately 500 kilobytes each) with your application. You have a TOTAL maximum of 4 Megabytes for your photographs. If necessary, you can easily decrease the size of your pictures in "Microsoft Office Picture Manager" or other software. Photographs about 500 Kilobytes each are optimum. If you would like to submit larger photographs, you may email them directly to William Khoury at wkhoury@americancamellias.org. Attach each photo to a separate email message to ensure the email server's file size limit is not exceeded. If you prefer to mail photographs, they must be high-resolution, electronic images and submitted on a compact disc or thumb drive. Printed photos are not acceptable. Please make certain that two different views of your flower are presented: (1) a frontal view looking into the face (top) of the bloom with NO measuring device present and (2) a side view showing the bloom height. In addition please submit (3) an overall view of the plant showing its growth habit and (4) a frontal view looking into the face (top) of the bloom with a measuring device present. For photograph (4) please include a coin or ruler in your picture to show relative size of bloom. It is requested that you take the photographs in "Landscape" format (an aspect ratio of 3:4 is best). Photograph (1) will be used for the American Camellia Yearbook. By submitting your pictures to ACS, you hereby agree and acknowledge that you are releasing any right, title and interest you may have in said pictures and you further agree that upon submission, the pictures shall become the sole property of the American Camellia Society ("ACS") and the ACS may use the pictures in its sole and absolute discretion in, among other things, ACS publications, fliers and on this website. If you need assistance, please call or email William Khoury at the ACS Headquarters. 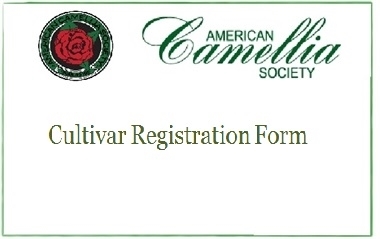 (877) 422-6355 wkhoury@americancamellias.org. Mailing CD with high quality photos. Mailing printed photos.